In this post, I will share ways to categorize new product development artifacts. I will clarify several memes. Then, I will offer a concept that individual contributors can use as they determine what they should be doing on a particular day. During new product development, many artifacts are produced. The word artifact is from the Latin phrase arte factum, skill + to make. Typically, the product is a valuable project artifact. 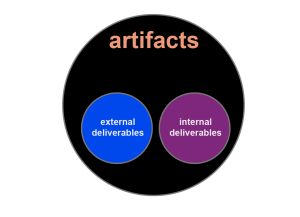 Other artifacts include items such as “design documents, data models, workflow diagrams, test matrices and plans, setup scripts, …” (from “What does artifact mean” on Stack Exchange). In the context of new product development, deliverables are a subset of artifacts. A product may be characterized as a set of external deliverables. Other items may be characterized as internal deliverables. Some of the internal deliverables may be maintained as documents. These are not the only artifacts. Secondary items produced during development. These may be unintended items. Items that are not incorporated into the current project but may be incorporated into future development efforts. This includes training. These items are a subset of artifacts. 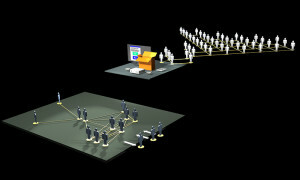 The number of items that could be explored during a project may be greater than the network’s (1) development capacity. Predictions about the future (including how much effort will be required to develop a particular item such as a user story or feature) are estimates about an emerging set of conditions. Some items are not on the list of considerations. Because of a lack of experience and insight, these items are not known. Some priorities may be specified explicitly. Some issues seem to require immediate resolutions. Some priorities evolve. Interruptions impact flow (2). This includes flow within functional groups and flow between functional groups and the system. There are dependencies. For example, a coder’s efforts may precede a technical writer’s efforts during development. The value of any artifact is subject to the perspectives of the stakeholders. Coders tend to value working code. Some individuals may stress the importance of prototypes they created. Copywriters tend to value persuasive messages. Other individuals favor spreadsheets. The status quo. A bias to repeat what was done previously. Value is attributed to what was delivered previously. Expectations from estimates and milestones. When a multitude of individuals with diverse specialties develop artifacts, there may be a tendency to sub-optimize efforts. Sub-optimization: A situation characterized by an individual (or a group of practitioners with a specific function) that tends to work within their specialty (sometimes referred to as silos) without regard for the impact on the output of the entire development effort (also known as the system). For the individuals that comprise the development network, producing artifacts quickly is not the main objective of new product development. That would be sub-optimizing based on a proxy for value. However, the capability to produce artifacts quickly contributes to achieving the main objectives. Besides making decisions about which artifacts to develop, choices are made about developing the capabilities to produce artifacts. These choices depend on the proficiencies of the individuals that are mobilized for the development network and additional training that they receive. Some specialists tend not to believe that solutions exist outside of their area of expertise. Although a cross-functional team strategy may surface a few perspectives, employing the concept of Requisite Variety provides multiple perspectives to inform better choices about the system. Better choices require considering the immediate needs and the entire timeline of the current project and the impact of the timelines related to future products. The interplay of functional specialties accelerates the development of implicit coordination. It improves the resiliency of the network. Invest in the development of Einheit, the short-term alignment of individual efforts. Invest to improve schwerpunkt, a concept that provides focus and direction for the long term. It provides actionable guidance in situations where there are no explicit directions. It reinforces mutual trust. According to John Boyd, Schwerpunkt “acts as a center or axis or harmonizing agent.“ (Boyd, Patterns of Conflict #78) It contributes to a focus on the results. Invest in the development of continuously self-correcting, network-informed schwerpunkt. This is the capability to adapt the concept that provides focus and direction over time so that the network can detect and correct mismatches from factors such as accumulated learning, evolving market conditions, and new boundary conditions. A continuously self-correcting NPD network has the capability to detect and correct mismatches from factors such as accumulated learning, evolving market conditions, and new boundary conditions. To be more successful in a development network, find better ways to produce and integrate artifacts that contribute to the goals of development. To make better hour-by-hour and day-by-day decisions, embrace a system perspective when writing more lines of code or producing more pages of documentation. Move beyond a perspective that is limited by reductionism or procrustean solutions. Encourage deliberative subtraction (deciding what not to develop) from the perspective of the system. Embrace new product development as more than a collection of diverse artifacts. Embrace new product development as more than a job characterized by obvious answers where choices are framed as ‘OR’ selections. Embrace “AND” selections that meet the needs of the present and anticipate development in the future. Facilitate set-based design over point-based design. Strive to be proficient problem solvers that also invest in future capabilities. Incorporate artifacts that contribute to the goals and minimize distractions. With that capability, you can improve your Development Experience [DX] which is another artifact that should be made skillfully. A New Product Development (NPD) Network is a temporary, dynamic, adaptive system designed to evolve a product vision and compare that to the reality of their current version. In an NPD network, individuals may report to multiple managers in multiple companies and have multiple priorities. Many individuals engage and disengage during the project. Often, the word “teams” implies that most of the individual contributors are employed by one organization and assigned to a relatively small number of functional areas (such as engineering and marketing). Often, an individual is assigned to a project for most of the duration of the project. In contrast, NPD work groups are assigned specific tasks. 2. Mihály Csíkszentmihályi proposed this concept of flow.